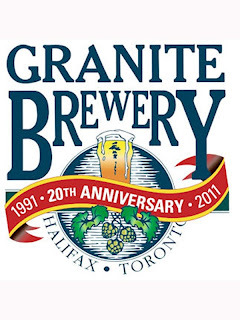 The Granite Brewery (Toronto location) will be celebrating St. Patrick’s Day by presenting the "Black Gold Stout Series" featuring six different flavoured stouts. On Saturday, casks of Chocolate Orange Stout and Vanilla Stout will be tapped in the tied house restaurant, as well as on keg, Chocolate Stout, Coffee Stout, Chocolate Chili Stout and Maple Stout. All of these were based on the same batch of Granite’s Keefe’s Irish Stout with flavouring added after the primary fermentation. Don't miss your chance to enjoy these and the regular Granite beer line-up as well as live music and Irish food specials this Saturday.